Recorded in a variety of spellings including: Hillam, Hilliam, Hillum, Hilem, and the dialectals Ilam and Illem, this is an English locational surname. 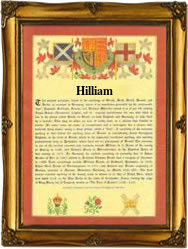 However spelt it originates from the village of Hillam near the town of Pontefract, in the county of West Yorkshire. The name means "of several hills", and is a reference to the fact that the particular area is hilly, the original village occupying several of the hillocks. The place name is first recorded in the famous Domesday Book of 1086 as "Hilum", but the surname is much later. Being a locational name it is a 'from' name. That is to say a surname which was generally given to a person, after he or sometimes she, left their original homestead and moved elsewhere. This could be the next town or city, the name is well recorded from the 17th century in the region around Leeds and Bradford, or in the city of London, the mecca for many of those seeking better work prospects. Either way the easiest method of indentifying a stranger was to call that person by the name of the place from whence they came. Spelling being at best erratic, and local dialects very thick, lead to the development of 'sounds like' spellings. Early examples of the surname recordings include: William Hillam who married Elizabeth Strirning at Cantley in Yorkshire, in 1589, exact date not recorded, and Abraham Hillam, whose daughter Mary, was christened at St Giles Cripplegate, in the city of Londfon, on July 1st 1655. This was during the "reign" of Oliver Cromwell (1650 - 1658).